Summary: Sophistication is important to a masculine closet. Here are some secrets how you can transform your closet into a sleek space. Designing a closet doesn’t have to carry a feminine connotation with it. 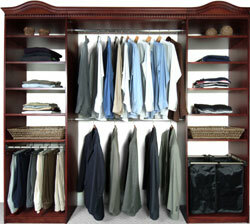 Men have created walk in closets that highlight their sophistication and class. Here are some tips that you can apply to your closet to steer it away from the stereotypical “female” style. Closet organization systems are one of the most important pieces of furniture to place inside your closet. If you have a walk in, you’re going to have more space to work with, therefore being able to maximize the capabilities of your system. What this means is that it should be the highlight of your closet. The attention should be focused on that main piece. All of your business suits, leisure wear, etc. are going to be hung or folded on these systems. It’ll be a wise decision to research the different organizer styles. Modular closet systems have been popular in the male closet primarily due to their look. Men want a strong and bold approach. With thick wood and sturdy frame supporting your closet system, people instantly characterize it with masculinity – assuming you leave your pink, fuzzy slippers off the shelf. A dark color scheme goes great to enhance the refined look of your closet. Black and white clothing articles along with leather shoes can showcase a professional but stylish look. You can even purchase discount closet organizers from a local furniture store and paint it with a dark grey semi-gloss if you’re feeling crafty. With so many different options available for you to work with, you can create a customized closet that fits your preference. Whether it’s a bright look that accents your lighter colors or the more dark and suave approach, your closet can be transformed into whatever you’d like.